So. . .you know what today was? Yep, February 15th. The day AFTER Valentine’s Day! We chuckled this morning about how many men (or women) opted for the strategy. . .”oh, it’s just another “Hallmark” holiday and I didn’t get you anything.” Hmmm. Not Good. Clearly, the Valentine’s phenomenon has been entrenched for years. We can both remember grade school and the ‘passing out of Valentine’s cards’. Brian was–well, less than a Valentine’s favorite growing up, so he was happy to get 5 or 10 of those little cards that came in a box as big as New York!!! While other kids were getting 15-20 Valentines. . .and this was in the day when a boy could give a boy a Valentine and a girl could give a girl a Valentine and NO ONE thought ANYTHING about it. Today–let’s face it. . .not so much. Why on earth would we bring up such a memory? Well, one thing we learned and shared was that when you had a family. . .THEY were your REAL Valentine. We both have countless memories of our sisters standing up for us when we were younger. On the school bus. . .on the playground. . .at the bus stop. . .it was FAMILY who stepped in to protect or make a difference. Brian looks at his sisters today and realizes that they were his “protectors” as a youngster. . .looking out for their ‘little brother’ and making sure he didn’t get into trouble. Well, here’s the 4-1-1 on that deal, they “fell asleep at the wheel” because he still managed to find trouble!!! Jean had four sisters before her to “look out” for her best interests, and to this day, they still talk about growing up here or there and going to school here or there . . .it’s amazing what family means–and not just around Valentine’s Day! Truth be told, we wanted to taste tonight’s wine–last night. However, after a terrific meal and wine at Bill/Dad’s place in Georgetown, we decided that a good night’s rest was more important than tasting a different wine. 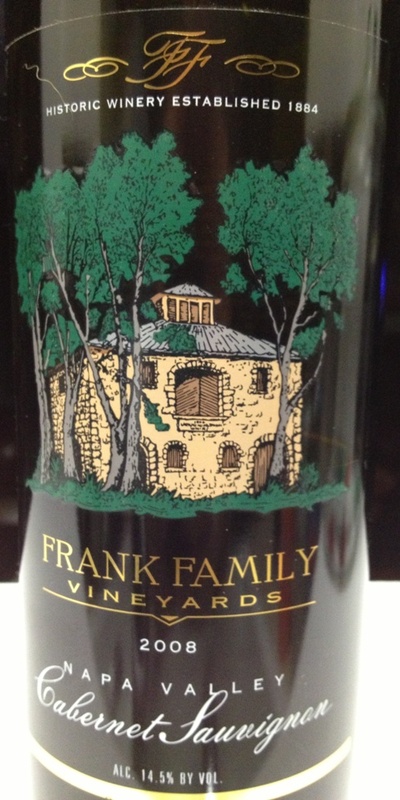 So, tonight we opened a special bottle of 2008 Frank’s Family Cabernet Sauvignon from the Napa Valley area. The first three words out of our mouths was, “OH, MY GOSH!”. . .or something to the effect! This was a wine that we purchased during Twin Liquors 75th Anniversary Sale last August. Yep, we’ve been laying this one down for six months and as of tonight, this wine was five years in the making! What an amazing wine! This wine is consistently rated at 90 points or above and after opening a bottle we certainly understand why. The nose is immaculate. . .so crisp and fresh. . .chocolate and cedar with a hint of berries was a welcome scent to start the journey with this wine. It’s a big CAB but not as big as previous vintages. It’s more of a medium body cabernet but with subtleties of strong wine making. Without question, we got ripe plum, cherry and currant notes on the taste. It was amazing how with time passing and the bottle opened, that these flavors became even more pronounced. We laughed at one review that pointed out, “A generous Napa Valley Cab loaded with black cherry, bittersweet chocolate and spice aromas that carry over to the palate. There’s even more fruit in the mouth, as the fleshes out to reveal plum and blackberry in addition to cherry, with a touch of mineral, plenty of spice and sweet, ripe tannins.” Now, this is a little too ‘over-the-top’ for us, but it illustrates a point. When you open a bottle of wine like this, you’re not going to be disappointed. And tonight, we weren’t! It was a magnificent bottle of wine, and it was made better by the anniversary sale price that was less than $30 for the bottle. If Frank’s Family Vineyards has an achilles heel, it’s probably a price point that keeps it from the ‘mainstream’ and puts it in the stratosphere for most wine lovers. Regardless, you’ll want to invest in a bottle of this wine for YOUR special occasion! As the week comes to an end and the weekend begins, we suggest you embrace YOUR family. Without them, you’re just another ‘boat on the horizon’; with them, you are a finalist for America’s Cup. There’s an old saying about you can choose your friends but you can’t choose your family, and both of us agree that FAMILY is a big part of who we are today, and our biggest hope is that we’ve passed on this important trait to our “family”. Please enjoy your favorite wine responsibly and remember to recycle whenever possible. Categories: Uncategorized | Tags: America's Cup, Black Cherry, chocolate, Frank Family Vineyards, Napa Valley Cab, Sisters, Twin Liquors, Valentine'sDay | Permalink.